Whatever your industry, customer service should feature right at the top of your list of priorities. Unfortunately, this isn’t always the case. Even if customer service is a top priority, knowing how to make a difference in this area of business can be difficult. 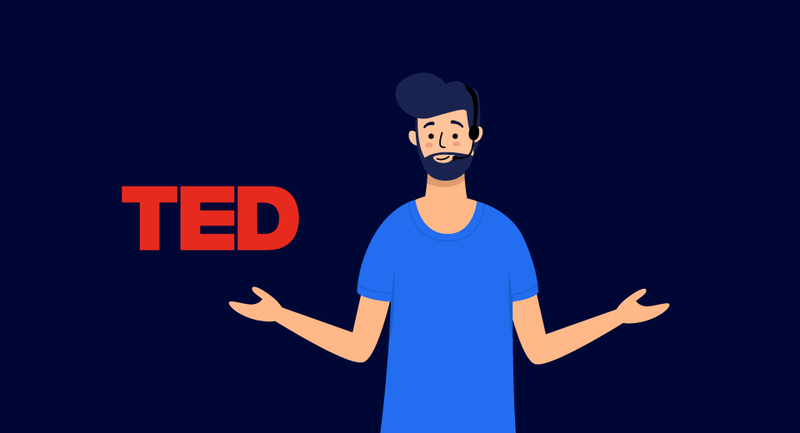 In this list of 20 best TED talks, you will find a range of interesting and insightful videos. These TED talks span industries, and focus on the many different aspects of customer service. Not only will they remind you of the importance of customer service, they will provide theories and strategies to help you tune into the needs of your businesses consumer base and empower your support staff. And hopefully the lessons you take away from these TED talks will make a real difference to your customer service. In the first of this TED talks collection, Tamekia MizLadi Smith addresses the importance of empowering customer service representatives. Smith covers key principles like ensuring employees know why they are asking questions, what is happening with the data they collect, and the importance of their role as a face of the company they work for. During this chat, Tamekia MizLadi Smith concentrates on customer service predominantly within the health industry. But the key takeaways of this chat are useful for any company that employs face-to-face customer service representatives who find themselves daily having ‘difficult conversations’ with customers. Delivered with humour and thoughtful insights, this is a great short watch. Frances Frei, a professor of technology and management operations at Harvard Business School, gives an insightful talk into trust. Based on her experience at Uber, she talks about the three main components that create a trusting environment – authenticity, logic, and empathy. She argues that by ensuring these qualities are present within an organization, trust, or the rebuilding of trust, becomes commonplace amongst employees and customers. The importance of being true to yourself, celebrating differences, and creating a culture of acceptance within companies, also rings clearly through this talk. This is a lesson that Frances Frei preaches not just for businesses, but for all of us to take into our everyday lives. An oldie but a goodie, and one that can’t be left out of this TED talks collection! Presented in 2004, ‘What Consumers Want’ has received over a million views, and still is very relevant to customer service today. In this TED talk Joseph Pine lays out the importance of authenticity around customer experiences and service, and focuses on the principles of understanding what the customer wants. That customers want to buy an authentic product, memorable service or experience is undeniable, but Pine argues that due to ‘mass customization’, authenticity no longer exists. However, he discusses a number of experiences and businesses, Disney for example, that are successful with artificial authenticity. An interesting watch, and one not to be missed. John Boccuzzi has more than 20 years experience in sales, marketing, and customer service, within both public and private companies. In this TEDx talk from Bryant University, John Boccuzzi discusses why excellent customer service has the potential to be the greatest form of marketing for a brand. Particularly relevant in this day and age of social media, Boccuzzi argues that it is customer service, not traditional marketing strategies, that will put your business on the map. A short but interesting chat, that you definitely add to your TED talks list. Sophie Andrews shares a strong message in this TED talk. It is, in fact, a message that many working in customer service positions and industries need to not just consider, but also incorporate into their dealings with clients. After having personal dealings with the UK 24 hour Samaritan’s helpline, Sophie Andrews founded The Silver Line, a helpline to support older, isolated and lonely people. In this talk, Sophie Andrews shares how her experience has taught her the importance of listening, and not just jumping in with advice. An emotional but powerful talk with a key message that needs to be heard. ‘Applied Happiness’ is a talk that was given by Jenn Lim at a TEDxKC event. Jenn Lim is the joint CEO of Zappos, and also holds the position Chief Happiness Officer of Delivering Happiness! The ethos of the brand is based on customer service and company culture, inspiring happiness in work, community, and everyday life. By ensuring happiness is always at the heart of their business, Zappos has become a thriving and successful business. This is an interesting look at how a business can be run, and customer service influenced, by the principle of happiness. This TEDx talk provides an interesting insight into both sides of customer service. Laura Hockenbury shares experience she gained working in the service industry. And she looks in-depth at behind the scenes stats on customer service workers in the US. Discussing the effects of working in the service industry, Laura Hockenbury provides advice for both service workers and customers. And with a focus on the importance of service workers authentically connecting, Laura Hockenbury’s talk is meaningful for those in and outside of the customer service industry. Another TEDx talk, but this time from Naperville, ‘Meaningful Micro-Engagements’ will get you thinking about customer service and technology. Jeannie Walters discusses the importance of micro-engagements and the impact they have on us, on society, and on our brand. During this TEDx talk, Jeannie Walters looks at a number of occasions where customer service messages from machines can cause frustration, negative reactions, and brand alienation. She then considers how we can use micro-engagements that occur via technology to create high-quality customer service, and ultimately turn customers into brand ambassadors. Andrew Tarvin has worked with thousands of people in over 200 organizations. His aim is to teach people the importance and value of humor, both in and outside the workplace. He gives examples of why humor can help in industry, including improving listening and communication, reducing conflict and stress, increasing trust, and much more. During Andrew Tarvin’s TEDx talk, he discusses his belief that humor can in fact be learned. This humor can then impact on people’s work experiences and interactions between people, helping with employee relationships and customer service. This is a very well presented talk, extremely funny, and contains some very actionable tips. Bobby Stuckey has had an extensive career working, managing, and owning restaurants, and has received multiple awards for wine and service. In this TEDx talk, Stuckey discusses the difference between service – “what you do for someone” – and hospitality – “how you make someone feel”. Sharing personal experiences from restaurants he has worked in and eaten in, Boddy Stuckey focuses on the importance of customer ‘experience’ in any industry. And importantly, how to make customers feel great. Another witty and well delivered chat, and easily one of the best customer service TED talks around. In this TED talk, Tim Leberecht sets the scene of today. He argues that, due to online behavior, brands and businesses have no control over their reputation. He then shares ways for businesses to use this loss of control to their benefit, by not only accepting loss of control, but planning for it. Leberecht, who describes himself as a humanist and a business romantic, in Silicon Valley, discusses the importance of giving customers control and empowering them with choices, or lack of choices. Ideas include collaborating with customers on the creation of content, designs, and products, giving them control over pricing, and taking away too many decisions. This is another useful and extremely relevant talk to online customer service. During this TED talk from Diana Dosik, she looks at how businesses engage with customers and come to understand customer journeys. This, in turn, enables them to deliver excellent customer service, tailored to their customers’ needs. However, Dosik also extends this concept to discuss how businesses can use this knowledge to understand and increase the productivity of their employees. Diana Dosik discusses a variety of tools, techniques, and theories, that companies use to help them understand their customers, and learn what makes customer experiences easy or hard. She uses the example of Apple, who monitored customers journeys within their stores. From this research, they then alleviated the key pain points that were preventing people from making purchases. A thoughtful TED talk, and one that many businesses could learn from. ‘How I Stole Great Customer Service with Pride’ is an insightful TEDx talk from Lisa Ekstrom. Here she discusses her career, working within the often frustrating department of customer service. Ekstrom shares problems that all customer service departments regularly come up against. And she talks about how to make small changes to ensure positive, and not negative, experiences prevail. She also shares an amusing anecdote, where she steals a customer services strategy, and how this experience played out in real life. The takeaway from this story is the idea that customer service strategies are easily transferable whatever a companies niche, and much can be learned and re-used across the customer service industry. Although this talk doesn’t specifically mention customer service, the lessons within it are relevant to anyone who works in this field. In this TED talk Amy Cuddy delivers an energizing and thought-provoking presentation about the power of body language. Here Cuddy argues that not only does our body language affect how others see us, it can also have a direct impact on how we see ourselves, as well as helping to increase our confidence levels. From changing our body language, to ‘power-posing’, Amy Cuddy gives us insight into how to change people’s perceptions of us, and how to ‘fake it until we make it’. This is a fascinating TED talk about body language, behavior, and our interactions with others. In this well presented TEDx chat, Alex Cabanas discusses great service moments. He argues that although companies want to achieve great customer service, it is in fact extremely hard to obtain, and not often come across. Alex Cabanas shares theories on why the bar is so low in customer service, and looks at the factors that prevent high quality service. He then uses personal anecdotes and real-life examples to explain how companies and individuals can raise the bar. An energizing talk, offering actionable ideas to improve customer service throughout a company and across industries. ‘What’s Next in Service for the Hospitality Industry, a Culture of Care’ is a thoughtfulTEDxx talk that will get you thinking about the culture of your company. Jan Smith is an expert in employee relations and customer service, and as a consultant she works with international corporations and non-profit organizations, to support and share her passion for service. In this TEDx talk, Smith considers why some service workers over perform, whereas others grossly underperform. She then goes on to discuss the importance of a culture of care, and how creating and nurturing this culture can affect both your employees and customers. This is a relevant talk for all businesses, and one that will no doubt give you food for thought. Joe Gebbia, the co-founder of Airbnb, gives an energizing TED talk about the creation of his global business. During this talk, Gebbia discusses how his business is built on the concept of trusting and treating customers and guests as friends. When Gebbia failed to get funding for his business, he fell back on what he knew: design. This enabled him to create a community and culture of trust and connection. This is an amusing and refreshing chat from Joe Gebbia, giving an insider’s view into Airbnb and its customer service. Jerry Inzerillo is the Chief Executive Officer for Forbes Travel Guide. During his fascinating TEDx chat, ‘Global Trends in Luxury Hospitality’, Jerry Inzerillo shares stories and experiences from his career. He focuses on not just how customer service leads to success, but how service deserves recognition. A funny and exhilarating chat, that has numerous takeaways for those working directly in customer service. Discussing ‘pride and service from your sole’, Jerry Inzerillo talks about the many outcomes of top class customer service. Mark Harmon is the founder of Auberge Resorts Collection, an international portfolio of hotels and resorts. In this TEDx talk, Mark Harmon discusses how to create a hotel with a soul, that delivers an unforgettable experience to those that stay in it. Harmon discusses his experiences of building hotels from the ground up. He shares what he learned and what he got wrong. Particular focus is placed on hotel staff, and how they can create stories and moments that connect guests together. Some useful lessons for customer service managers and staff, this TED talk is worth watching. In the last of the TED talks of our collection, Anna Dolce discusses the difference between genuine hospitality and service-by-default. From a decade and a half in the hospitality industry, Anna Dolce speaks from experience about the expectations of everyday service, and the importance of instead providing memorable hospitality. Anna Dolce is clear that great service is no longer enough in the increasingly competitive world of business. She explains the difference between the two notions of service and hospitality. And then gives numerous examples where companies have ensured people’s needs are met emotionally through top quality hospitality. The top takeaway from this talk has to be the idea that hospitality is a big concept, but is built through the tiniest of moments. As you can see, there are a wide assortment of TED talks that will help you to improve your customer service. Whatever your industry or position within your company, the TED talks mentioned in this collection will give you much to think about. And hopefully, much to act on.